Impress your friends by looking into the future. This crystal ball may not actually help you do that, but here's how you can make it look like it did: Stare into the ball, chant mysteriously. roll your eyes back into your head a bit, then stare back into the orb and tell your friend, "I see your hair thinning ... Your eyesight will begin to fail you ... I see large medical bills in your future." I shouldn't kid, though. There's probably somebody out there right now using this miniature crystal ball to scry on me for making fun of this sort of thing. They're probably burning a candle and a picture of me and cursing me with extra ear-hair or something. This miniature crystal ball is made from flawless molded crystal. It's about 3 1/4 inches in diameter and looks unbelievable in both strong light and dim light. It sits on a gothic pewter stand that features four frightful gargoyles. The gargoyles support a pewter ring on their backs which in turn braces the crystal ball. In the clawed hands of each of the gargoyles is a small, volcano-effect crystal. What, you are asking, is a volcano effect crystal? Well, it's a small crystal that, when rubbed and the magic words spoken, can cause volcanoes to erupt. Really, it's quite amazing, and you rarely find them around at this price range but ... I just received a warning from my boss to stop claiming that the crystals can cause volcanoes to erupt. ... Sigh .... Okay, so the crystals MAY not be able to cause volcanoes to erupt. But they do look really cool. In fact, they change colors and scintillate with the light, creating extremely colorful defraction effects. Above each gargoyle is a protective pentagram and below this pentagram the gargoyles spread their leathery wings. The crystal ball can be lifted off the pewter stand and placed on a clear resin block-stand (included), or used as a really really huge glass eye. This is a truly magnificent piece. It makes a sprightly gift and a glorious display piece. We have a limted amount of these in stock, so grab one while you can. materials: Flawless, Molded Crystal Ball. 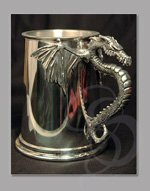 Gothic Pewter Stand. Four Half-Inch Volcano-Effect Crystal Spheres. 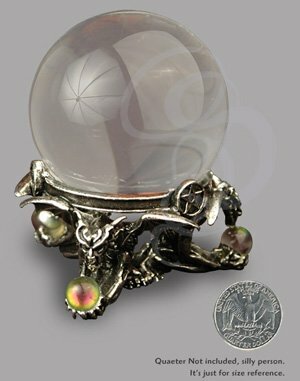 Resin Display Stand for Crystal Ball.